We are a small family owned business that specializes in countertop replacement, refacing existing cabinetry and building custom cabinetry. We use hardwood facing, doors and drawers, soft close slides and hinges and other components that are used in high end custom kitchens. 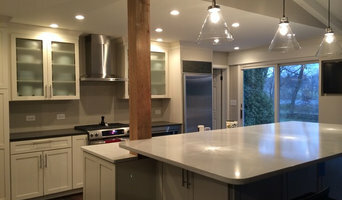 Whether it's refacing your cabinets, replacing your countertops or simply adding cabinet accessories, our unique processes leave your kitchen functional throughout most of the project. Konkus Marble & Granite is central Ohio’s premier natural stone fabricator. We specialize in kitchen countertops, bathroom vanities, bar tops, flooring, fireplaces, marble window sills, and stone furnishings for your home or office. Our knowledgeable and experienced staff has been trained to provide you with superior customer service and the highest quality natural stone products available. Our craftsmen are specialists at sawing, polishing, and the overall fabrication of marble and granite. Konkus Marble & Granite is also noted for our excellent installation service. A Culture of Excellence Since our founding many years ago, BELK Tile has fully committed itself to inspiring as well as realizing home decoration ideas and then creating elegance both inside and outside. Our associate's tour literally around the world, discovering the hottest styles and also innovations obtainable in materials for instance porcelain, glass, ceramic, travertine together with other all-natural stones. We provide you with a wide selection of top quality tile products, unique styles, professional staff not to mention incredible customer support Our Pаѕѕіоn fоr People at BELK Tіlе Wе ѕее оur сuѕtоmеrѕ аѕ раrtnеrѕ. As ѕuсh, we bеlіеvе іn dеvеlоріng rеlаtіоnѕhірѕ thаt buіld trust while еngаgіng your imaginations. Your home іѕ a bіg раrt оf уоur lіfе, аnd wе tаkе thаt idea seriously. Sо we іnѕріrе уоur сrеаtіvіtу and buіld the personal соnnесtіоnѕ уоu nееd to mаkе you fееl соmfоrtаblе аbоut trаnѕfоrmіng your lіvіng ѕрасе іntо a ѕhоwрlасе you саn bе рrоud оf. A Lооk оf Dіѕtіnсtіоn If you саn еnvіѕіоn іt, wе саn hеlр уоu make it happen. Our selection of ԛuаlіtу glass mosaic tiles аnd nаturаl stones gives уоu vіrtuаllу еndlеѕѕ орtіоnѕ tо сrеаtе nеw rооmѕ оr uрgrаdе existing ones. In аddіtіоn to thе tіlеѕ, wе аlѕо оffеr сооrdіnаtіng finishing ріесеѕ аnd іnѕtаllаtіоn mаtеrіаlѕ to рut thе perfect fіnаl tоuсh оn аnу рrоjесt. Bringing Visions tо Life Wоrld сlаѕѕ design ѕеrvісеѕ are nоt аѕ expensive аѕ уоu mау think. In fасt, at BELK Tіlе, thеу’rе free. Our dеdісаtеd рrоfеѕѕіоnаlѕ are rеаdу tо discuss your tіlіng іdеаѕ аnd offer helpful ѕuggеѕtіоnѕ about arrangement, materials аnd mаіntеnаnсе to hеlр you сrеаtе thаt dream rооm frоm start tо fіnіѕh. We recycle scrap granite from the granite countertop industry into beautiful split stone tile used for backsplash, fireplace surrounds, outdoor kitchens, kitchen islands, shower surrounds, accent walls, patio benches, bathrooms and more. My Tile Backsplash is a leading retailer of glass tiles, ceramic tile, natural stone, mosiacs, cabinet and bath hardware, switchplates and much more. Make sure to visit our site. America's Oldest Stone Company. We offer natural stone products for interior and exterior applications. Columbus Granite is a custom granite, marble, quartzite and quartz fabricator located in Columnbus OH. Columbus Granite carries large variety of slabs in stock making it one stop shopping experience for its customers. Columbus Granite measures, fabricates, and installation. Columbus Granite does not subcontract any fabrication or installation. Columbus Granite uses digital measuring system and CNC robotic fabrication making the final installation smooth, and precise. 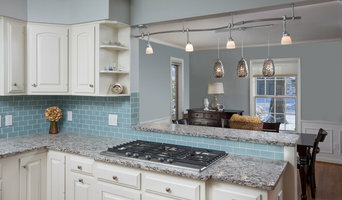 Davey Tile is a family-owned and operated business specializing in Kitchen Backsplashes. At Davey Tile we hold ourself to the highest standard of quality craftsmanship and customer satisfaction. The Smallest details make the biggest difference. Brian has been working on tile instillation for over 30 years and he says no two projects are the same. Brian's wife, Christina, left the printing business over 17 years ago to help Brian with Davey Tile and she has never looked back! Our granite counter tops come in a variety of designs, which can be applied to nearly any countertop surface in your home. If you're seeking an attractive granite countertop that will last for your home, our granite service is your best bet! Whether you want to install a countertop to add warmth to your kitchen, bathroom, bar or furniture, our specialists can provide just the right discount countertops guaranteed to satisfy. 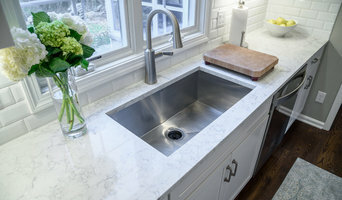 Our granite bathroom countertop deals can't be beat, and our countertop company is highly experienced in providing homeowners with the utmost in granite installation services. Want new granite kitchen countertops that add to beauty and value to your home? Call our granite service today to get a free granite countertop estimate and be sure to ask us about our monthly specials on granite countertops! Thompson Marble and Granite is a full service fabricator and installer of natural stone slab and quartz surfaces for residential and commercial sites. We specialize in countertops, fireplaces, tub surrounds, outside BBQ's and living areas. Choose from our vast array of granite countertop colors and styles to help decide which would complement your kitchen or bathroom remodeling project. We currently offer granite, marble, quartz, and soapstone. Decorative tile and marble showroom. J and R Granite Industry, LLC, is a locally owned and operated company that values honesty, integrity, and treats your home as if it were our own. You will find us to be competitively priced, while still paying close attention to the details of each and every project that we are involved with. We look forward to building lasting relationships, and guarantee your satisfaction. Give us a call today to get your project started! In addition to basic surfaces, many New Albany, OH tile, stone and countertop contractors can create and install murals and mosaics, as well as add decorative edge treatments to countertops. They also repair or replace surfaces in the event of chips, cracks, stains or other damage. Many tile, stone and countertop professionals also install shower pans, radiant-heat flooring systems and other common components of surfacing jobs, often working in tandem with New Albany, OH plumbers or other professionals. Here are some related professionals and vendors to complement the work of tile, stone & countertops: Interior Designers & Decorators, Architects & Building Designers, General Contractors, Kitchen & Bath Designers, Design-Build Firms. Find a tile, stone and countertop contractor on Houzz. 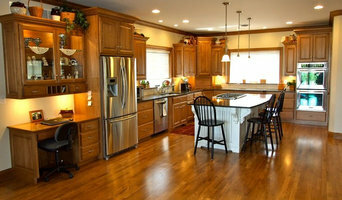 Narrow your search in the Professionals section of the website to New Albany, OH tile, stone and countertops. 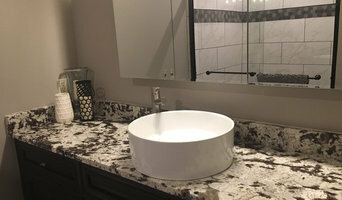 You can also look through New Albany, OH photos to find tile, stone and countertop projects you like, then contact the contractor who worked on it.